Carbon Fiber and High Quality Fiberglass Composite Blank Tangle-Free Stainless Steel Frame Guide with Ceramic Ring Stainless Steel Winding Check High Density EVA Anti-Slip Front Grip Durable ABS and Metal Reel Seat. Transport Length:136 cm (4'6"). Durable Stainless Steel Guide. Harpoon stands 6-feet tall. 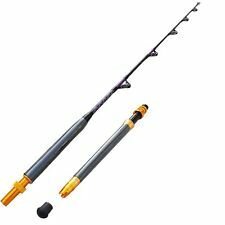 Ideal for use on big fish. High Quality Carbon Fiber Tough and Slim Blank. High Density EVA Anti-Slip Front Grip. Transport Length: 110 cm - 3'7". High Modulus Japan Toray Carbon Cloth. Transport Length=3'10" (117 cm). High Quality Carbon Fiber Tough and Slim Blank. High Density EVA Anti-Slip Front Grip. Transport Length: 112 cm - 3'8". High Modulus Carbon Blank. Signing of Parcel. High Quality Fuji Reel Seat. Best Quality Japan Fuji New Concept Guides. High Modulus Japan Toray Carbon Cloth. Transport Length=3'7" (110 cm). High-quality Epoxy and Thread. 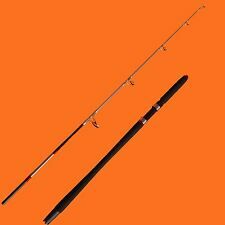 3 Section 30-50 Lbs Offshore Big Game Saltwater Sea Fishing Jigging Boat Rod 6ft 7ft Specification Material:Graphite Hardness:Super hard Category: Lure Rod/Boat Fishing Rod/Sea Fishing Rod/Surf Fishing Rod Closed Length: 2' 3" Length: 7ft Color: As the picture Origin: US Package: 1 x Fishing Rod(without reel) ​Notice: Dear our customer Because fishing rods are measured by hand,so date of the above can be a little different with your received fishing rods. It is normal and wish you can understand us.If you have problems still,please contact with us. Wish you get a big fish. Trainfis Fishing Tackle Co.,Ltd has a professional R & D design team, and hired numbers of senior Japanese designers and professional anglers to design and produce various fishing lure、fishing rod and other fishing tackle.